The Catholic Office for Youth & Young Adults is a ministry within the Archdiocese of Adelaide and the Catholic Education Office of South Australia. We work in partnership – affirming, encouraging, challenging and supporting young people and those who accompany them, on their faith journeys. The Catholic Office for Youth and Young Adults is part of the Religious Education Team of the Catholic Education SA Office. We strive to provide young people throughout the Archdiocese of Adelaide with opportunities and events that will support them in their faith and you will find many of these advertised on this website. The Catholic Office for Youth and Young Adults serves young people 16 to 35 years old across the Archdiocese of Adelaide. 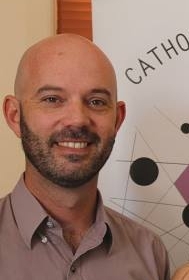 The Coordinator is responsible for leading the COYYA team, setting the goals and objectives for youth and young adult ministry in the Archdiocese of Adelaide, and initiating programs in the Archdiocese to meet the needs of youth and young adults. Prior to coming to the Archdiocese of Adelaide, Peter was a parish youth minister in Minnesota, USA. Peter is also an adjunct staff member of the Center for Ministry Development, a youth ministry writer, speaker, and musician. Peter has a Bachelor of Arts in Music and Master of Arts in Pastoral Ministry from St. John's University School of Theology and Seminary in Collegeville, MN. Peter is married to Lauren and they have four young children. The Youth Ministry Support Officer works closely with Youth Ministry Leaders in schools, parishes, and communities, as well as leads projects and services that contribute to youth ministry development such as youth leadership formation and retreat support. Before joining COYYA, Holly was a youth minister in the Southern Cluster Youth Ministry team, emcee for the 2015 Australian Catholic Youth Festival, and radio host on 1079 Life and Arch D Radio. The Youth Communications Support Officer produces Arch D Radio, a weekly radio broadcast and podcast involving young people across the Archdiocese and in Catholic Schools. James has been on the COYYA team since 2012 producing Arch D Radio and Coordinating large scale events such as the Australian Catholic Youth Festival in 2015 and the Double M Fest in 2010. James is also an accomplished Blues guitarist.